The Treasure Hoarder Mouse is a breed of mouse found in the Sunken City. It is known to drop a variety of loot. The Treasure Hoarder Mouse seeks out the shiniest of shiny, the most precious of preciouses to adorn on its body. These mice cover themselves in shiny, valuable objects in order to attract potential partners. When a male meets a female, they compare looks and potential overall wealth to determine if they are fit for one another. You better hope they don't beat you to some treasure! 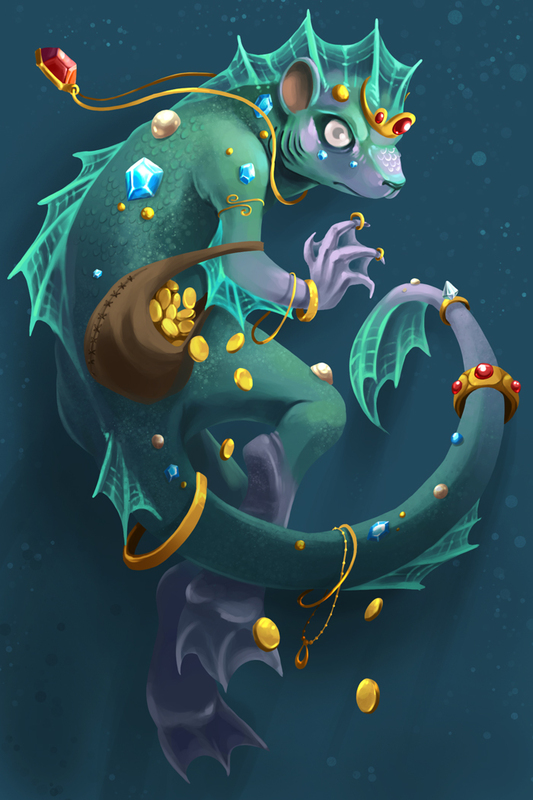 It's extremely difficult to remove treasure from them once they've gathered it up and affixed it to their naturally sticky scales. The Treasure Hoarder Mouse has no specific preference for any kind of cheese. The Treasure Hoarder Mouse is susceptible only to Hydro weapons. It can be found in the Sunken Treasure zone while on a Dive in the Sunken City. The Treasure Hoarder Mouse drops the Deep, Deep, Deep Egg, the Sand Dollar Egg and the Sunken Treasure Egg during the annual Spring Egg Hunt. The Treasure Hoarder Mouse was released 2 July 2014 as part of the Sunken City content. This page was last edited on 27 May 2017, at 01:57.